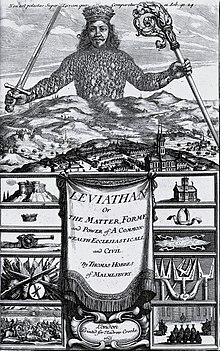 Leviathan is a famous book by Thomas Hobbes. Its full name is Leviathan or The Matter, Forme and Power of a Common-Wealth Ecclesiasticall and Civil. Hobbes wrote the book in 1651. The name of the book comes from a sea monster called "Leviathan" in the Book of Job (one of the books in the Old Testament of the Bible). In Leviathan, Hobbes writes about the structure of society and what makes a good government. It was a very early book on social contract theory. It influenced many other writers. He also wrote a version of the book in Latin in 1668. ↑ Stanford Encyclopedia of Philosophy. "Hobbes's Moral and Political Philosophy"
This page was last changed on 25 October 2017, at 09:48.